Preheat the broiler. Heat a small saucepan over medium heat, add half the butter to the pan. 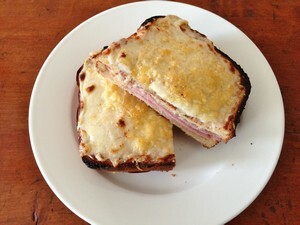 While the pan is heating and the butter is melting, construct your sandwich with the ham and most of the cheese (2/3). Spread the remaining butter on the top of the sandwich. Cook the sandwich in the pan, turning when the bread is golden (about 5 minutes) and continue cooking until the cheese has melted (about another 3-4 minutes). Remove the sandwich from the pan, place on a sheet of aluminum foil or an oven-proof tray. 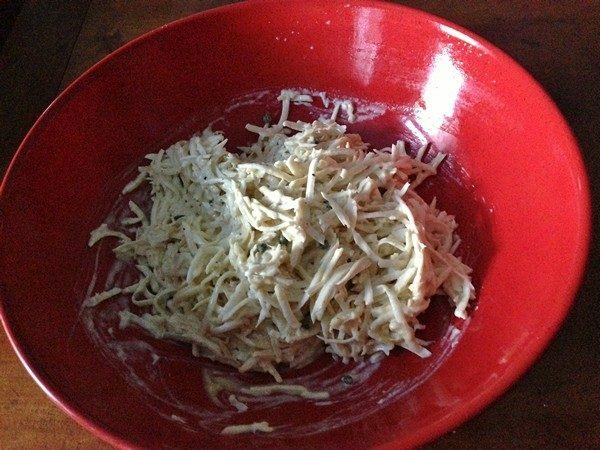 Spread the mornay sauce over the top and sprinkle with the remaining cheese. Broil until the sauce is bubbly, the cheese has melted and is starting to brown. Serve and enjoy! My verdict: It was delicious and you might see more good white bread in my kitchen than is probably good for me! I did it like a regular grilled cheese and then topped it and broiled it-not sure if that’s the authentic way of doing it. Sometimes the mornay sauce is under the bread, but then it doesn’t brown. I also like mine with the smallest amount of a really sharp Dijon mustard added to every bite. I say this because some recipes have you add it to the sandwich, but I prefer to be the master of my mustard. Because this is a simple sandwich, all the ingredients should be the best you can find. I used a Pepperidge Farm Farmhouse White loaf and it was pretty good for commercial bread. Now, off to Murray’s for some really good ham and gruyere! Escaping the cold, the Accidental Locavore is hiding out in Palm Springs, California. 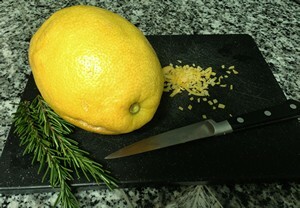 Besides the great weather, there is the added advantage of a backyard full of lemons, grapefruit and rosemary. I bought some lamb chops to stick on the grill and then, spying the rosemary hedge, thought a simple marinade was in order. This is pretty improvisational, so feel free to add and subtract what you want. I like to add balsamic vinegar as it seems to have a tenderizing effect on the meat. Combine all the ingredients in a small bowl and mix well. Taste and adjust the seasonings to your liking. With all marinades you want a slightly stronger taste as it will be subdued in the marinating process. Place your meat in a Ziploc bag, add the marinade and make sure the meat is coated all over with the marinade. Seal the bag and refrigerate for at least 4 hours. One hour before you’re going to cook your meat, remove the bag from the fridge and let the meat come to room temperature. Cook, serve and enjoy! One of the reasons the Accidental Locavore loves to cook is because you get to try all the interesting recipes that cross your path. Often, the most difficult part is figuring out that age-old question, “what’s for dinner?” Today, I had an edge; Frank wanted chicken, roasted chicken, so I had the perfect excuse to pull out an old favorite Julia Child recipe for poulet grillé à la Diablo. 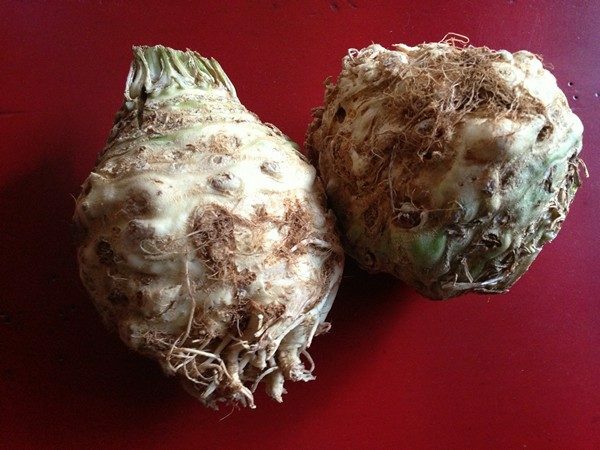 It’s a recipe I used to make all the time, easy and tasty. It brings into play a little-used part of the oven, the broiler. 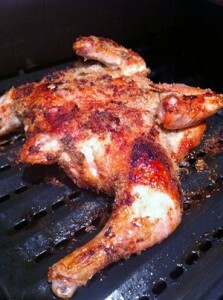 The Accidental Locavore revisits an old favorite chicken recipe from Julia Child:Poulet Grillé à la Diable. Main course chicken recipe. Preheat the broiler to moderately high. Melt the butter with the olive oil in a small pan. Dry the chicken thoroughly and paint both sides with the butter mix. Put the chicken skin side down in the bottom of a broiler pan (without the rack). Place it so the chicken is about 5-6" away from the broiling element and cook for 10 minutes on each side, basting with the butter mix every 5 minutes. The chicken should be lightly browned. 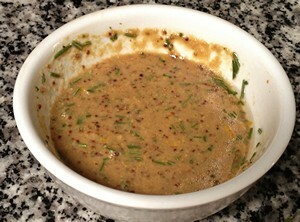 While the chicken is cooking, put the mustard, shallots, herbs, salt and peppers in a small bowl. Slowly pour the remainder of the butter into the mix, beating it well to emulsify it. When the chicken is done, add half of the fat from the pan, slowly beating into the mustard mix. Reserve the rest of the fat. Paint the chicken with the mustard mix. Pour the breadcrumbs into a wide shallow bowl, or plate. Roll the chicken in the crumbs, patting them so they'll adhere. Place the chicken, skin side down, on the broiling pan, this time with the rack in place. Drizzle with half the basting fat. Broil under moderately high heat for 10 minutes. Turn the pieces over and drizzle with the remaining fat. Cook for another 10 minutes or until the juices run clear when pricked with a fork. Serve and enjoy!